Dutch Bihary got his start in the art world at the age of eighteen illustrating comic-books. His introduction to the face and body painting world was abrupt. Dutch's wife, Brecky, volunteered him to fill in at a U-pick pumpkin patch in October of 2005 and that was all it took. He could do art and "make people smile"! He is now known as one of the top instructors and teaches classes locally and internationally. His unique painting style led him to coin a learning technique he refers to as 'Blobology'. 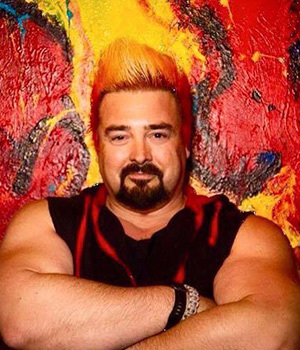 Dutch's artwork and teaching got him noticed and invited as a contestant on the first season of SKIN WARS, and is now a personality on the spin off show, FRESH PAINT. Although Dutch enjoys face and body art, he is not limited to it. In 2009, a haunt friend approached him on the application technique of Chromadepth™. Dutchwas excited about this new mural art and learned all he could on the subject and has now become one of the nation’s top 3D UV artists. Along with his wife and two girls, Arreah and Zayda, they have built and annually run 3 full-size attractions. Dutch’s life is either fast and furious or very slow for long periods of time. During this slow time, Dutch dives into canvas art, sketching and other art mediums. He truly enjoys getting requests for commissioned artwork. In this past year, he has added a tattoo parlor to his store to fill some of the slow times. He likes the idea of his artwork lasting a lifetime instead of a day. When Dutch is in the store, he also loves getting his hands dirty with special effects make up, sculpting, and molding work and has several movies and music videos to his credit. He also, teaches classes in all types of special effects makeup, applications and techniques. Dutch now works a VFX Foam in Burlington, WA as a foam sculptor and painter. They are a 3D Sculpting And Theming Studio Dedicated To Delivering Amazing Experiences! But, He Continues To Work In The Temporary Body Art Industry, Teaching And Offering Services When Possible. Dutch and his family work together and are opening a new storefront in Mount Vernon, Washington. They plan on "making people smile" for the next 20 years.